NEW YORK – – November 15, 2016 — Sisense, disrupting the BI market by simplifying business analytics for complex data, today announced early users of its Sisense BI Bots program are driving increased BI engagement with this latest innovation in the Sisense Everywhere program. Building on its mission to simplify business analytics, Sisense BI Bots create a new way to consume and interact with business insights through Artificial Intelligence (AI), enabling everyday users and teams to engage in two-way instant-message conversations about their data, using their messaging platform of choice. This third innovation of the Sisense Everywhere program – following the Sisense-enabled Amazon Echo and the Sisense-enabled IoT lightbulb – is initially launching with support for Slack, Skype, Facebook Messenger and Telegram. It seems that the next step of this evolution is here—let’s call it the conversational office era. Today’s offices are highly distributed, highly productive, with a major focus on online communication and knowledge sharing. The modern office communication medium is text-based, rather than face-to-face interaction or phone calls. This communication becomes the office knowledge-base, it facilitates collaboration, makes cross-group work more productive and makes the on-boarding of new workers easier. BI, especially for complex data, has traditionally been targeted at technically-savvy users – IT users or data scientists – who are able “slice and dice” data. By bringing BI into employees’ natural environments, Sisense BI Bots is removing another barrier and giving all users access to powerful data insights within the chat communications tool of their choice. The AI integration and Sisense engine behind the scenes is enabling all users to make faster, more informed business decisions without switching applications – humanizing business intelligence. 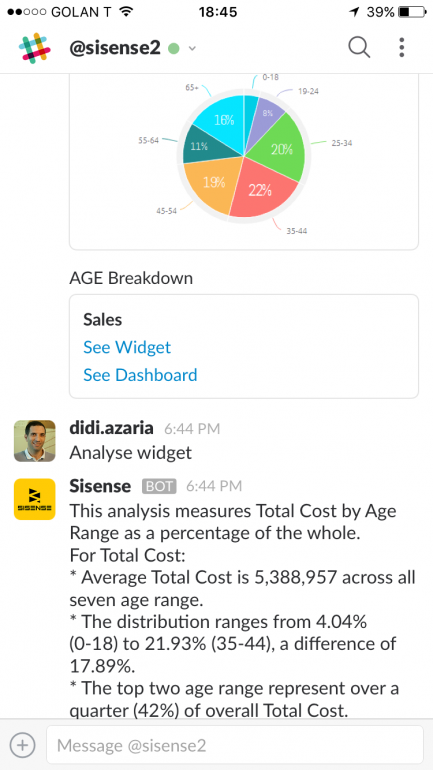 Sisense BI Bots create an ‘on-call’ business analyst, allowing users to access data in plain English and be proactively alerted to powerful data insights through messaging platforms they already use for day-to-day office communication, such as Slack or Skype. The Bot learns from organizations based on usage, in order to push key insights to users when they need them, and alert users to critical anomalies in their business. Users can chat with the Sisense BI Bot just as they would with another colleague, from the device of their choosing. When engaging with the Bot, users can simply type a question such as “what is my sales revenue,” to receive an instant response and analysis of trends in their business. Sisense allows users to interact with the Bot one-on-one or in a group discussion to serve as an additional resource. Early customers have already witnessed the impact of Sisense BI Bots when it comes to efficiency and aiding in faster decision-making. I like the idea of being able to use language to answer data question. The Bot comes back with not only results from the dashboard, but pictures (widgets, set of widgets) and the ability to filter. This was a really big item for me. Sisense simplifies business analytics for complex data. Powered by its unique In-Chip™ and Single Stack™ technologies – Sisense delivers unmatched performance, agility and value, eliminating much of the costly data preparation traditionally needed with business analytics tools and providing a single, complete tool to analyze and visualize large, disparate data sets without IT resources. With more than one thousand customers in over 50 countries, including global brands like Target and Samsung, Sisense was recently designated a hot company to watch by CIO, CRN and Information Management and recognized as one of the “10 Most Innovative IT Ventures” at Under the Radar. Its solution won the “Audience Choice” award at the O’Reilly Strata conference and its CTO won the World Technology Award for the invention of In-Chip analytics. Sisense simplifies business analytics for complex data. Powered by its unique In-Chip™ and Single Stack™ technologies – Sisense delivers unmatched performance, agility and value, eliminating much of the costly data preparation traditionally needed with business analytics tools and providing a single, complete tool to analyze and visualize large, disparate data sets without IT resources. With thousands of customers in over 50 countries, including global brands like GE, Philips, Target and Samsung, Sisense was recently included in Forbes’ list of the 25 Next Billion Dollar Startups, ranked one of the 50 highest-rated private cloud companies to work for by Glassdoor and Battery Ventures, designated a hot company to watch by CIO, CRN and Information Management, and named an ‘Overall Leader’ by Dresner’s 2016 Wisdom of Crowds Business Intelligence Market Study. Its solution was recognized in the web customer experience category by the 2016 Frost and Sullivan Awards, the company won the “Audience Choice” award at the O’Reilly Strata conference, and the company’s CTO won the World Technology Award for the invention of In-Chip analytics.